The tedious task of changing the size of your photographs to send the via email can become a simple action: just dragging and dropping them into a folder. Dropresize is the tool that will make it possible to do this. The first step we will have to take, is to tell Dropresize what folder is going to become the special "watch folder" (as the program calls it). From that moment on, the images that are placed in the folder will automatically change size. To configure the options or access the chosen folder, you will only have to click on the notification icon in the system tray. 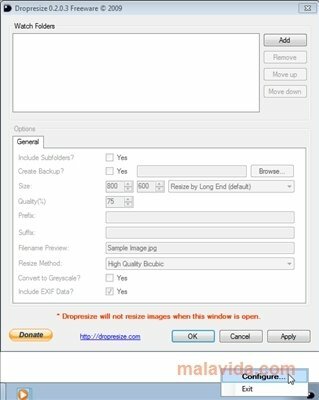 With Dropresize you will be able to include sub-folders in the watch folder, create backups to avoid loosing the original images, include prefixes or suffixes in the image names, or to choose the resize method. This comfortable tool will quickly change the size of your images and will save you a lot of time. Thanks to its simple interface your should have no problems when it comes to using it. This download requires a ZIP compatible compressor. It also requires that you have .NET Framework 2.0 or above installed.